Jawatan kosong AirAsia 2016 di Johor Bahru. Peluang kerjaya Airasia Johor Bahru untuk kekosongan jawatan Guest Service Assistant dengan penempatan kerja di Senai lnterational Airport. Warganegara Malaysia yang bermastautin di Johor Bahru dipelawa untuk memohon. 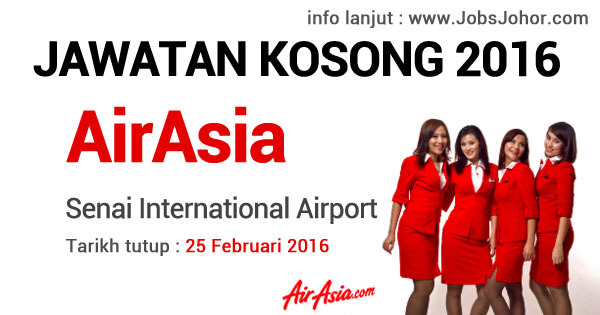 AirAsia Jobs 2016 in JOHOR BAHRU : Jawatan Guest Service Assistant- Ground Operations, Malaysia. * Perform under pressure in a challenging environment. * Proficient in oral and written English and Bahasa Melayu. * Excellent computer skills and proficient in excel, word, outlook, and access. * Ability to maintain high confidentiality, tactful and discretion when dealing with people. * Possess good interpersonal and communication skills. * Must be able to perform shifts and work on weekends and public holidays. * Cheerful personality with positive attitude. in any field with a minimum of credit in English, Bahasa Malaysia and Mathematics. * Proficient in English and Bahasa Malaysia. * Must be able to start immediately. * Computer literate and posses good writing skills. * Age between 20 to 35 years old. Applicants must be willing to work in Senai lnterational Airport. SUBMIT ONLINE AND AIRASIA BERHAD WILL INVITE YOU. 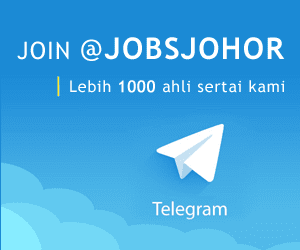 Permohonan secara online sila layari laman web JOBSTREET disini.